Hawthorne Cat, the exclusive Cat® equipment dealer in San Diego, the Hawaiian Islands, and the Pacific Region, is making it easier for local businesses to upgrade equipment at affordable prices. Purchase a qualifying new Cat machine from now until June 30, 2018 to receive 0% financing for 60 months and a new 2-year standard warranty on select new Cat machines. “Now is the time to upgrade your fleet and take advantage of great offers on the highest quality machinery out there,” says Ross Farmer, Sales Manager. Eligible new machines for the 2-year standard warranty offer include: Compact Track Loaders, Mini Hydraulic Excavators, Multi Terrain Loaders, and Skid Steer Loaders. 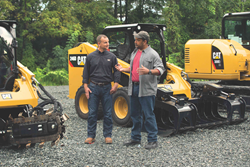 A standard one-year warranty is included when purchasing new Backhoe Loaders, Compact Wheel Loaders, Small Track-Type Tractors, Small Wheel Loaders, and Telehandlers. Contact your Hawthorne Sales Representative for complete offer details.